I have been buying legendary vintage audio for the last 9 month's, I came across this kenwood kr-9600, I named it Dino, big, powerful, and old, To my astonishment, it is in mint condition, everything works except the power switch is stuck on, to say the least, I do not believe I've ever seen a tuner this good, with a piece of two inche wire antenna this this picks up endless stations from abroad, also, this Dino is a whopping 160 watts RMS per channel, I've studied everything about this unit, I know exactly what I want to do to it, from Etna simic two, nichicon kz and fg capacitors to modification's, my plan is to recap all 91 capacitor's, put a relay with fuse on the power switch after it has the carbon cleaned out from in rush current, change the op amp out on the tuner Board for audiophile grade new one for better sound , change out three resistors to aluminum finned new one's on the power Board, the original one's are underrated and get to hot from factory, etc..., I need to find someone that know's this kenwood kr-9600 inside and out, that has reworked one of these, competent, to do all this work, please help, thankyou audiogon community. years ago, I bought one of these brand new. Lots of power. Even back then, the PS filter caps were worked pretty hard, and were prone to leaking. may want replace those first before you power it up. Hi Johnss, the unit is fully functional currently, I suppose I got lucky, I'm wanting to high end this unit, the tuner is incredible, do you know anyone that can work on these? Johnss, I plan on a complete recap of the unit. I owned a KA-7100 integrated amp which I think must have come from a slightly earlier era, because the top model, the KA-9100, hade only 90 watts per channel. Mine was a whopping 60 lol. "DC Coupled True Dual Monaural" IIRC. It worked from 1976 to nearly 2002. I died when the giant vol. pot. spun freely around. The sound was good so -if for nothing else, fixing up the amp part, without the tuner, is prolly worth your time if you can do it yourself. You are setting yourself for expensive parts list. Hi Mechanics, The kr-9600 was made in 76, it is duel monaural, direct coupled, yes, I am doing an expensive parts list, with the High end caps alone, I doubt this unit will even sound like vintage kenwood. 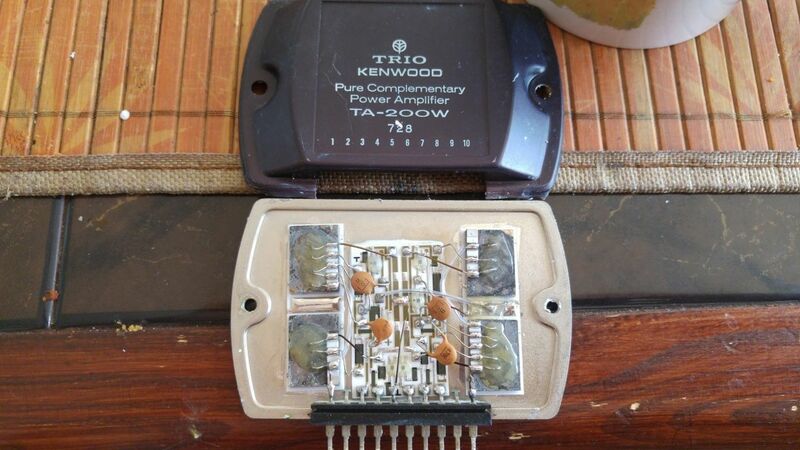 Is there any audiokarma people here?, or, where is a qualified kenwood KR-9600 technician in U.S.? I don't know any pure vintage Kenwood sites. But you might want to try the Audio Asylum vintage audio asylum. There must be a group Kenwood nuts. Kenwood engineers went on to form Accuphase via an intermediary ? Kensonic? etc My son wanted the gear I had when I was in high school but every time I bought another KA-7100 it had problems worse than my own and I gave up. If it turned on the Ebay people would say 'works' but they didn't. I have a KR-9600 and it is a great vintage receiver. Be careful with the power switch - it is not buffered so it takes the whole AC surge when switched on and is prone to failure. Replacements are unobtainium. Best to use an external device to power the receiver on and off instead of the switch. Another area of concern is the custom Kenwood Darlington power module. Also unobtainium. Hi dlcockrum, you are exactly right about the power switch, the switch on my kr-9600 is stuck on, however, if you look on the net, the switch’s are incredible, the guy showed pictures of him taking the switch out, taking it apart and completely cleaning the black carbon build up out, putting the switch back together, re-installing the switch, works like new, also, after that, on another website, a gentleman installed a relay on the switch, with a fuse , the switch will never need repaired again, this off sets the current in rush to never happen, my darlington power pack’s are in pristine condition, however, even on another website, another gentleman that is an electronic engineer, shows how to rebuild the power pack's ’s, I need a qualified person to do all the modification’s and recap, I have just come across someone that might?, be of help, legendary amps.com a guy name skip, , do you know anything about this company? My capacitor's are not leaking or crowned, I just want Elna, and nichicon cap's through out, with the crazy pick up endless stations tuner inside this unit, I wanted to make this as high end in sound as possible, I do know the capacitor's are orginal, that said, 40 year's is amazing they work, but Dave, we both know I would get better sound with new capacitor's based on the age of the original capacitor's. Don't know anything about Legendary Amps. Looks like they specialize in Yamaha. I would talk to several vendors before deciding. The reason I brought up the Darlington modules is that extreme care should be taken during the refurb to protect these from electrical damage during testing/power up. Sometimes the old adage "If it ain't broke don't fix it" plays out in these cases. Mechans, I didn’t know that the engineer’s from Kenwood started Accuphase, very interesting, From my research, Audio karma is the site for this kenwood kr-9600, seems technician’s frequent this site, along with diy enthusiast, have you gentleman ever seen the inside of this reciever?, It has many board’s, 91 capacitor’s, no!, not me, lol, I’m not going to attempt doing any thing my self. dlcockrum, curious, what speaker's are you running with your kr-9600? The KR-9600 is in my vintage system. I rotate between Pioneer HPM-100 and Watkins WS-1a (Watkins Dual-Drive woofers) speakers using either the tuner or one of three vintage TTs (good phono stage in the KR-9600) as the source with a Pioneer SG-9500 12-band EQ between the pre-out and main-on jacks. Fantastic sound on Blues and Rock. Maybe also ping Benny at Modular Electronics Inc.? He's quoted me reasonable prices in the past and seems to be willing and able to take on all kinds of projects to your specifications. Old thread but wanted to ask “Audiolabyrinth” who it was that told him he could rebuild the 9600 power modules ? Been told this is a no go, but guess anything’s possible. Hi tasar, I did alot of research a year ago, it was a electrical/electronic’s engineer that completely rebuilt the module’s because it was said it could not be done, the gentleman did not even work for or own a electronic’s company, the both of us can research the internet to find him, he explained how to do the job, currently, I do not remember, but I was amazed when I found it at the time, fortunately, my module’s are in good shape 🎼🎶🎵. Would be nice if someone would post a link here to that video, I'm not that savy, lol.